Granthamania: The Library is Fun! Chloe has had a big day today and it's not even noon. We joined Ashauntee and Kennedy for library time. It's been awhile because Chloe and I were out of town, then we were sick and then we had her 9 month check up. But today, we jumped back in the saddle to go see our friends at the library! I've mentioned that Chloe loves books now. Well, she was the baby that crawled over to the librarian to see the pictures. It was pretty funny. She even tapped the lady's leg so the lady would show her the book. It was precious. When it was time to sing, Chloe danced (bounced in a sitting position and bobbed her head) while she sat in front of the librarian. 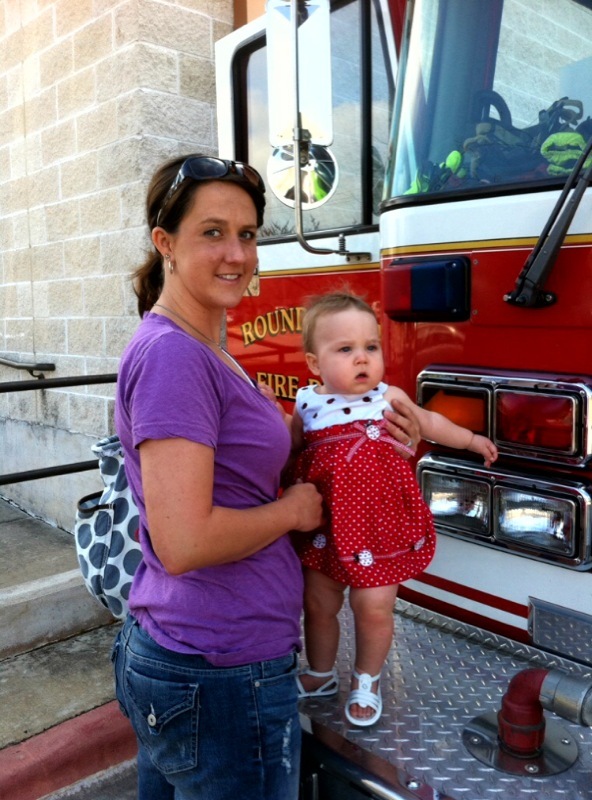 After story time, the librarian told us that the fire department had stopped by for the older kids to see the truck but we were welcome to take the babies out to see, too! So we did. My friend, Ashanutee, took this picture of me and Chloe in front of the truck. Chloe has no idea how cool this is. But you see her looking off at something? She's looking at the firemen! She already loves a man in uniform! 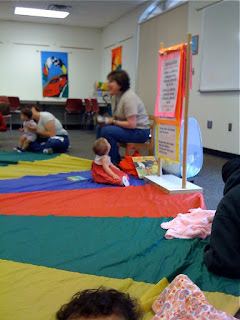 So cute, love that she crawled to the librarian! So glad she had a great time! That picture of y'all is great! Chloe is way ahead of babies her age. She seems to capture everything she sees. Wish I could have seen the action with the librarian while Chloe performed as she enjoyed the book reading. 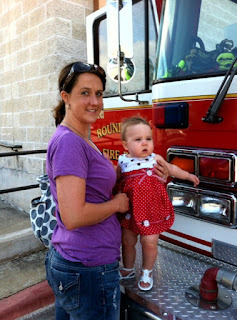 You both look so pretty by the fire truck. You picked pretty colors to be dressed in.